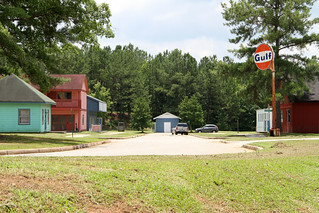 The Mock Village at the GPSTC is a tactical training area that features classrooms and seven buildings modeled after structures found in typical Georgia towns. The Mock Village includes a bank, an office building, a convenience store, a motel, a warehouse, a residence and a gas house, used for training students on how to respond in the presence of chemical agents. The Mock Village plays a critical role in developing the skills of Georgia’s public safety officers. The props and buildings contained within the Mock Village give students the opportunity to react to a multitude of real-world scenarios that represent situations officers will encounter on the job. Students who train in the Mock Village learn building approach, entry, search and clearance, tactical assault, raid concepts, and pedestrian operations. They also employ role playing to enhance the realistic nature of the training. Courses conducted at the Mock Village include: Active Shooter, Counter Sniper II, Officer Survival, High Risk Arrest Warrants, SWAT Team Training, and more. Several buildings within the Mock Village are equipped with state-of-the-art camera surveillance equipment and trainees may wear helmet cams that record their movements. Instructors are then able to provide a comprehensive critique of an officer’s performance.